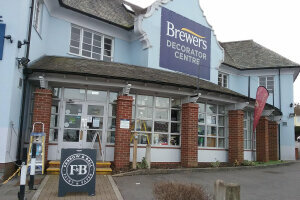 Our Filton Bristol Brewers Decorator Centre is perfectly positioned for discerning painter decorators and homeowners from a wide area north of Bristol centre. Our newly expanded store features a full range of trade and designer paints, a wallpaper department and protective coatings and specialist paints. We offer trade and cash accounts, excellent technical advice and a free local delivery service. Tradespeople can also book a site visit so we can inspect a site and make sure you’re choosing the best products for the job. You’ll find us on Filton Avenue (with ample parking outside) on the corner of the junction with the A4174 Station Road. We’re in a distinctive 1940s building that used to be The King George VI pub. Travelling along Station Road, the store is on the junction of Filton Avenue on the left corner.